Over the past two decades, inflammation has been recognized as a major driver in the pathogenesis of several common diseases, including atherosclerosis, diabetes, cancer, and asthma. Over the same period, there has been a steep rise in the incidence of obesity, a major risk factor for these disorders. Inflammation of adipose tissue is now recognized to accompany obesity and contribute to its sequelae. Thus, whereas obesity is primarily a disorder of energy balance, it may be helpful to consider it also as a form of epidemic inflammation that predisposes to other forms of epidemic inflammation. It is a fundamental biologic challenge to understand how a positive energy balance and inflammation are linked. This work reviews evidence that reactive oxygen and nitrogen intermediates (ROI and RNI) help drive chronic inflammation in the obese. This is proposed to be a maladaptive instance of our evolved dependence on ROI and RNI for both homeostatic signaling and host defense. ROI and RNI are well suited for these seemingly contradictory dual functions by their metabolic origin, high diffusibility in water and lipid, atomic specificity, and large number of molecular targets. When we eat so much and work so little that we repeatedly generate reactive compounds at levels normally reserved for emergencies, we treat our own cells like invading microbes. Between 1980 and 2004—in the space of a generation—more than half of Americans (1) were among the billion people worldwide who had become overweight (body mass index [BMI] 25–29 kg/m2) or obese (BMI ≥30). Obesity is a potentially lethal inflammatory disorder whose pathogenesis we are at a loss to explain. Inflammation is life-promoting when it fights infection and helps heal wounds, but life-threatening when it kills pancreatic islet cells in diabetes, thickens blood vessels in atherosclerosis, mutates DNA and spurs blood supply in cancers, or constricts airways in asthma. We’ve made progress in understanding these older forms of epidemic inflammation [for example, (2)], but we lack a conceptual framework to help us understand the pathogenesis of inflammation in obesity. Recognition of the link between inflammation and obesity dates to 1993, when the inflammatory cytokine tumor necrosis factor (TNF)-α was shown to arise from adipose tissue in obese rodents and contribute to their insulin resistance (3). Insulin resistance is a state in which fat, muscle, and liver cells fail to respond normally to insulin, which can lead to increased glucose and fatty acids in the circulation. Ten years later, it emerged that adipose tissue is infiltrated by macrophages in obese children and adults (4) and mice (5), in proportion to how far they exceed normal body weight. These macrophages express TNF, inducible nitric oxide synthase (iNOS), and other inflammatory substances. Very recently, changes diagnostic of inflammation—increased leakiness of vessels and adhesion of leukocytes and platelets—were documented in the microcirculation of visceral, but not subcutaneous, adipose tissue in obese but not lean mice (6). The products arising from inflamed adipose tissue (adipositis) contribute to an inflammatory state in distant cells, such as endothelium, arterial and bronchial smooth muscle, and pancreatic islets. This systemic inflammation helps drives insulin resistance, endothelial dysfunction, and high blood pressure (hypertension), conditions that often progress to diabetes and atherosclerosis, and also predisposes to asthma and certain cancers (7). It is not proposed that inflammation is an initial cause of obesity. Obesity results from chronic positive energy balance. However, obesity frequently leads to inflammation that appears to arise first in certain deposits of fat. Adipositis can exacerbate obesity by dysregulating adipocyte-derived regulators of feeding. In some obese individuals, cytokines arising from cells in fat appear to induce inflammation in distant sites, contributing substantially to obesity’s adverse effects. I argue below that excess ROI and RNI appear to act as both products and mediators of adipositis and the wider inflammation that sometimes ensues. With excess ROI and RNI helping to drive vicious cycles, inflammation can be both an effect of obesity and a contributor to its progression and sequelae. The recent upswing in the incidence of obesity suggests a key role of environmental factors. Attention has focused on microbes and nutrients. Let us consider them in turn. When an inflammatory disease spreads like an epidemic, it must be scrutinized for an infectious cause, even if it appears to spread more readily via social than spatial links (8). There are provocative links between microbes and obesity. Germ-free mice are resistant to diet-induced obesity (9), raising the possibility that a specific microbe may cause adipositis. The putative pathogen might infect adipose tissue, as can Mycobacterium tuberculosis (10), or might infect adipocytes themselves, as can be seen in vitro with adenovirus 36 (10). The proportion of obese Americans far exceeds the proportion infected with M. tuberculosis, however, and there is no evidence that an adenovirus localizes in adipose tissue in vivo and inflames it. Alternatively, a microbe might release a product that localizes to fat, much as streptococcal cell walls can localize in joints and cause arthritis. Yet another way to account for the dependence of diet-induced obesity on resident microbes is that the innate immune system does not develop normally in a germ-free host. Thus, without the resident microbiota, the inflammatory response to a nonmicrobial stimulus may be dampened. Mice are also relatively resistant to diet-induced obesity when the gut microbiota are present but components of the host’s microbial sensing machinery, such as CD14 or TLR4, are missing or faulty (11,12). Finally, the microbiota, particularly colonic Firmicutes, mobilize more calories from food than the host does on its own (13); however, one would expect a compensatory regulation of appetite. In short, although we should not abandon the idea that obesity could have an infectious cause, it would be more prudent to consider that the problem is of our own making. Obesity might instead be caused by defects in the signaling systems that tell us when to eat and when to stop. Hormones from the gut, brain, skeletal system, and fat regulate these powerful urges, and such hormonal circuits are dysregulated in the obese. However, obesity is only rarely attributable to mutations in genes encoding such a hormone or its receptor. Variants in a putative nucleic acid demethylase (14) predispose to obesity (15). Variants in any number of other genes may eventually be found to do so as well. Nonetheless, genetic effects alone could not account for a doubling in the incidence of obesity in one generation. This rate of change mandates a focus on the environment. Two environmental factors that we internalize, glucose and fat, are good candidates. These or their products might directly engage cell-surface receptors and trigger pro-inflammatory signals. For example, excess ingestion or production of glucose might increase the levels of advanced glycation endproducts (AGEs), which engage their receptor (RAGE) on macrophages and other cells that can induce oxidant stress and activate NF-κB, a pro-inflammatory transcription factor (16). Fatty acids can bind cellular proteins that are homologous to G protein-coupled receptors (17), but the binding is blocked at physiologic concentrations of albumin and Ca2+. Likewise, oleate and palmitate (bound to albumin) can activate inflammatory cells by binding to the CD14/ TLR4/MD2 receptor complex, in which MD2 physiologically binds bacterial endotoxic lipopolysaccharide and other microbial products (18). The ultra-low-affinity interaction of fatty acids with CD14/TLR4/MD2 seems unlikely to account for obesity-associated inflammation, however, because it has been demonstrated in vitro at levels of free fatty acids that circulate normally in plasma. If activation of inflammatory signaling cascades by plasma membrane receptors for glucose, glucose-derived products, or fatty acids is unlikely to be the whole story, we should direct our attention to the cytosol. Hyperglycemia does not promote atherosclerosis in mildly hyperlipidemic mice unless they express aldose reductase, a cytosolic, glucose-metabolizing enzyme (19). Moreover, adipositis and insulin resistance caused by feeding mice a high-fat diet require macrophage expression of cbl-associated protein, a cytosolic protein required for glucose transporters to move to the plasma membrane in response to insulin (20). Finally, an anti-inflammatory fatty acid binding protein called aP2 (21) is cytosolic. These findings suggest that the key actions of high glucose and high fat depend on metabolism in the cytosol. What cytosolic signals are generated in common by metabolism and inflammation that might regulate both? Evidence favors two answers: ROI and RNI. These sets of compounds appear to be generated by organisms in every phylogenetic class throughout the aerobic biome. ROI and RNI regulate intracellular signaling and gene expression differently depending on whether they are produced at low levels for brief periods or high levels for prolonged periods, as occurs during inflammation (22). High levels of these mediators also promote mutagenesis, cytostasis, apoptosis, and necrosis (23, 24, 25, 26). It is widely appreciated that high levels of ROI and RNI are generated during inflammatory and immune responses and play a critical role in host defense (27). Less obvious but equally fundamental are their low-level generation by, and impact on, intermediary metabolism. A major function of intermediary metabolism is the generation and disposition of electrons that accumulate temporarily in NADPH and NADH, and the closely associated response to and regulation of the intracellular concentration of O2. O2 and NADPH or NADH are cosubstrates for generation of ROI, depending on the source, whereas O2 and NADPH are cosubstrates for generation of RNI. ROI and RNI in turn regulate intermediary metabolism in multiple ways. For example, a major physiologic role of nitric oxide (NO) is to regulate the rate of mitochondrial respiration (28), and H2O2 rapidly and stoichiometrically decarboxylates α-ketoacids, such as pyruvate, α-ketoglutarate, and oxaloacetate (29). In mice infected with Staphylococcus aureus, products of iNOS inactivate the pathogens’ pyruvate dehydrogenase and pyruvate formate lyase, forcing the bacteria to dispose of excess reducing equivalents by secreting lactate (30). If the iNOS in adipocytes similarly inhibits their pyruvate dehydrogenase, it might help drive their deposition of excess reducing equivalents in the synthesis and storage of fatty acids. ROI and RNI also regulate each other’s generation. For example, NO promotes mitochondrial generation of superoxide (O2−) (28). O2− titrates NO, leading to formation of a much more reactive form of RNI, peroxynitrite (OONO−). There is striking evidence for increased production of RNI, probably OONO−, in people experiencing hyperglycemia. This is the simplest way to explain the close coupling between the level of glucose in their blood and the level of methyl nitrate in their breath (31). In mice fed a high-fat diet, pharmacologic blockade of NO synthesis improves insulin sensitivity and reduces weight (32). There is copious evidence for production of excess ROI by adipocytes, endothelial cells, and vascular smooth muscle cells exposed to high glucose in vitro or in vivo (33, 34, 35). Moreover, the inflammatory changes (such as NF-κB activation and formation of AGEs) and insulin resistance associated with high glucose levels are suppressed by antioxidant treatment of adipocytes or mice (34,35). When glucose is elevated, excess ROI arise from three prominent sources: mitochondria (36,37), the endoplasmic reticu-lum (ER) (38), and a family of NADPH oxidases (NOXs). Mice are protected from diet-induced obesity by partial inhibition of mitochondrial electron transport, the source of mitochondrial ROI (39). They are similarly protected by compounds that reduce ER stress, a process that provokes excess ROI generation by the ER (38). Finally, NOXs are selectively elevated in white adipose tissue of obese mice and generate ROI upon exposure of adipocytes to fatty acids. Treatment of these mice with NOX inhibitors improves their diabetes and hyperlipidemia (40). A striking feature of metabolism-triggered ROI and RNI generation is the profusion of feed-forward loops that amplify their production. For example, glucose-triggered ROI drive cells to produce a lipid aldehyde, 4-OH-trans-2-nonenol (HNE) (41), which reacts with glutathione. Aldose reductase reduces glutathionyl-HNE to glutathionyl-dihydroxynonene, which induces TNF, interleukin (IL)-1β, IL-6, and chemokines (41). The chemokines can attract and activate macrophages to produce more ROI and RNI. ROI and RNI can damage DNA, leading to activation of NF-κB, which in turn enhances their cellular production (42). In addition, high glucose synergizes with cytokines to induce iNOS in vascular smooth muscle cells (43). The resulting RNI can inhibit mitochondrial electron transport, promoting ROI production (28,44). The OONO− formed as a result inhibits mitochondrial superoxide dismutase, allowing more OONO− to be formed, inhibiting mitochondrial electron transport at additional steps and generating more ROI. Figure 1 summarizes some of these molecular events. Vicious cycle at the molecular level, set in motion by excess consumption of glucose and fat. SOD, superoxide dismutase; mt, mitochondrial. The impact of these amplification loops on endothelial NOS helps explain the vascular dysfunction that underlies many of obesity’s harmful effects. 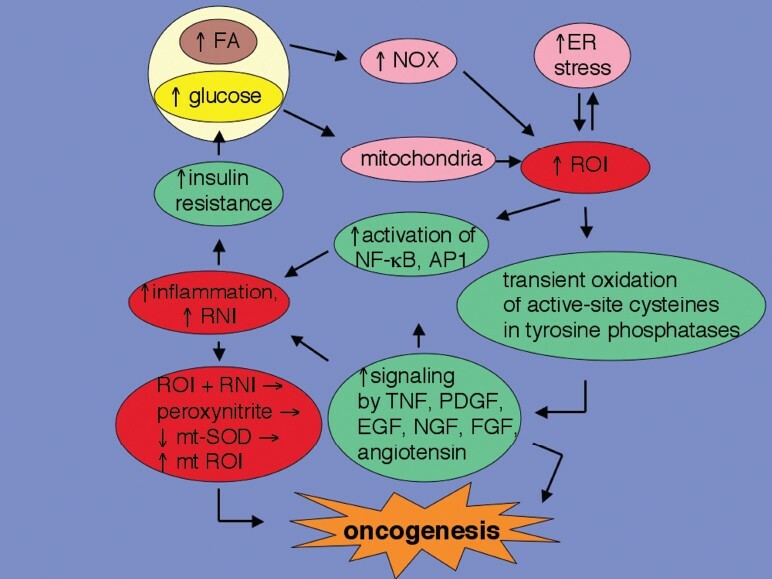 Mitochondrial ROI generation triggered by exposing endothelial cells to high glucose promotes glycosylation of a site on endothelial nitric oxide synthase (eNOS) that normally undergoes phosphorylation when the kinase Akt activates the enzyme (45). As a result, eNOS becomes harder to turn on. Normally, eNOS functions to relax underlying vascular smooth muscle and to prevent overlying platelets and white blood cells from adhering. Thus, dysfunction of eNOS may help account for the tendency of people who repeatedly metabolize excess glucose to develop high blood pressure and to allow platelets and monocytes to adhere in their vasculature. The latter events are key steps in the development of atherosclerosis and its complications, such as myocardial infarction. Similarly, the OONO− that arises when glucose is elevated suppresses GTP cyclohydrolase, the rate-limiting enzyme in formation of tetrahydrobiopterin, a NOS cofactor (46). Without tetrahydrobiopterin, eNOS makes superoxide instead of vasoprotective levels of NO (47). If cells generate even higher levels of OONO−, they oxidatively inactivate the remaining tetrahydrobiopterin (48), thus contributing to vascular dysfunction. Some of the evidence discussed above is based on glucose being elevated in cell culture or blood. Most obese people do not have elevated blood glucose, however, and many with diabetes or prediabetes, despite sometimes having elevated blood glucose, are not obese. Nonetheless, the propensity of obese people to become diabetic may hold important clues to the pathophysiology that drives the progression from adipositis to systemic inflammation. In those who are overweight or obese but not yet diabetic or prediabetic (meaning that their blood glucose does not exceed a defined level when fasting or after a standardized meal), repetitive consumption of much food is likely to lead to excessive ROI and RNI production in adipocytes and endothelial cells. Food ingestion sufficient to promote excessive formation of cellular ROI and RNI may not be reflected in abnormal blood glucose levels. Overeating may lead to excess metabolic throughput without an elevation of blood glucose, or there may be elevations that do not exceed what has been defined as the upper limit of normal. Finally, overly frequent eating may disrupt diurnal rhythms important for metabolic control (49). Metabolism, like inflammation, has complex control mechanisms that can fail. Among the most important metabolic regulators are nuclear receptors, and these also control inflammation (50). Moreover, nuclear receptors can both affect and be affected by ROI and RNI. For example, the metabolism-regulating nuclear receptor Rev-erbα includes a heme group, which is likely to be subject to redox regulation and nitrosylation (49). RNI nitrosate fatty acids and nitro-fatty acids can activate another nuclear receptor, peroxisome proliferator-activated receptor-γ (PPARγ) (51), that suppresses hyperglycemia and inflammation (52). Although this is a potentially anti-inflammatory action of RNI, it raises the possibility that some of the numerous pro-inflammatory actions of RNI may involve dysregulation of nuclear receptor signaling. There is an enormous literature on intracellular signaling by ROI and RNI. Yet, many if not most, published cell signaling models omit them. This may reflect disbelief that the same molecules can both signal and kill, doubt that seemingly nonspecific molecules can regulate cell function, and confusion over their contrasting effects in different settings. In fact, it is commonplace in biology for organisms to compete by interfering with each other’s signaling, and evolution appears to favor signaling molecules as both mediators and targets of cytotoxicity (26). Thus the function of ROI and RNI in killing microbes does not exclude, but rather predicts, that they also serve as important signaling molecules. The distinction between the two functions depends on timing and amount. Insulin signaling offers a classic example. The small amounts of H2O2 produced in cells on binding insulin are required to optimize phosphorylation of downstream signaling molecules by transiently inactivating tyrosine phosphatases through reversible oxidation of their active-site cysteines. In contrast, in large amounts or on prolonged exposure, H2O2 inhibits insulin signaling. ROI and RNI also display exquisite specificity, although this specificity is atomic rather than molecular (26). Whereas ROI and RNI react with only a few kinds of atoms in particular states, such as acidic sulfurs in the side chains of active-site cysteine residues, such atoms are present in many different molecules, including the active sites of most phosphatases, as mentioned above. When a cell responds to a signal, it commits resources. Facing multiple and successive signals, the cell must balance its commitments with its resources. The diffusible nature and atomic specificity of ROI and RNI allows them to integrate many signals and tune numerous signaling pathways in accord with the cell’s metabolic state. Thus, RNI and ROI help link the behavior of a cell to its metabolic budget. The foregoing discussion cited experiments with adipocytes, vascular smooth muscle cells, and endothelial cells. If excess caloric consumption triggers excess production of ROI and RNI in many different kinds of cells, why is adipositis the earliest histologic evidence of obesity-associated inflammation? Adipocytes are unique among mammalian cells in that the vast majority of the cells' volume is occupied by fat. Oxygen dissolves to a far higher concentration in lipids than in water. The oxygen concentration in the water phase was found to be lower in adipocytes in obese mice than in nonobese mice, in part because adipocytes increase in size with obesity (hypertrophy) and this interferes with their blood supply (53,54), as do the adherent leukocytes and platelets in their microcirculation (6). Paradoxically, abnormally low levels of oxygen in cell water (hypoxia) increase mitochondrial generation of ROI (55). Thus, oxygen-deprived adipocytes may produce ROI in part because they are hypoxic, and this production may be more sustained than in other kinds of hypoxic cells because the mitochondria of adipocytes abut a lipid-based depot of O2. At the same time, the fat vacuole may put adipocytes at high risk for formation of lipid oxidation products, which can trigger cell death (56). Perhaps for this reason, an increased proportion of adipocytes in obese individuals are necrotic (57). Hypertrophic adipocytes are surrounded by activated macrophages. Activated macrophages respond to necrotic cell debris by generating oxidants and chemokines. Chemokines in turn promote further macrophage infiltration and activation (58). For all these reasons, adipocytes in obese individuals may be exposed to a greater oxidant load than most other cells. Excess levels of ROI and RNI can also result from their reduced consumption. The antioxidant capacity of adipocytes is likely to be severely restricted because their cytosol is scant. Whatever their starting levels, some of the antioxidant reserves of adipocytes decline in obesity. Indeed, levels of superoxide dismutase, glutathione peroxidase, and catalase are markedly lower in adipocytes from obese mice than from nonobese mice (40). Taken together, the foregoing considerations prompt the testable prediction that hypertrophic adipocytes may have the lowest antioxidant capacity of any cells relative to their oxidant load. Adipose tissue normally secretes appetite-regulating hormones (adipokines). Obesity is not only associated with increased ROI generation selectively in white adipose tissue, but also with dysregulation of adipokine production. It is particularly significant that this defect is correctable in mice with compounds that inhibit ROI-generating NOXs (40). 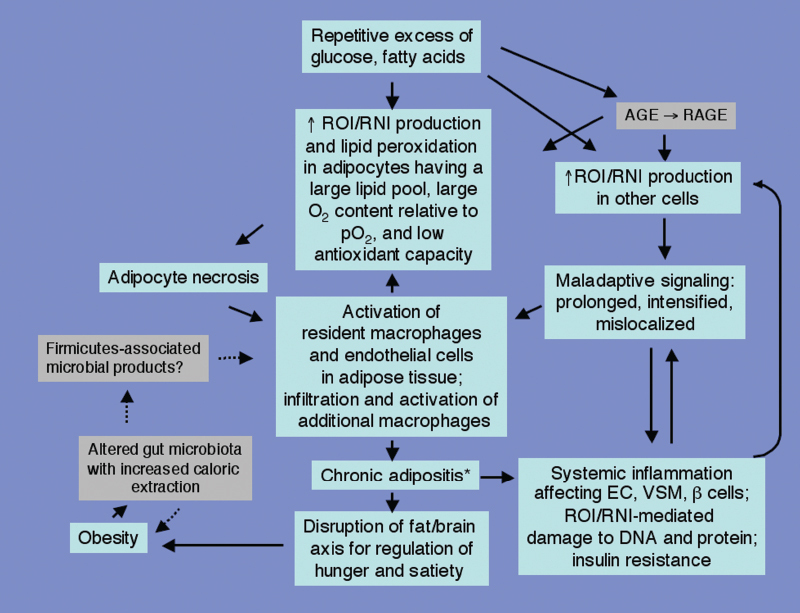 Thus, ROI-dependent damage to adipocytes may contribute to loss of appetite control. This may make it exceptionally difficult to reverse preexisting obesity through diet alone. In effect, adipositis sustains a feed-forward loop in both figurative and literal senses. Figure 2 schematizes vicious cycles that may operate at the interorgan level. Vicious cycles at the organ level, set in motion by excess consumption of glucose and fat. EC, endothelial cells; VSM, vascular smooth muscle; β cells, insulin-producing cells in the pancreas. Asterisk with chronic adipositis: leading to altered production of leptin, adiponectin, resistin, visfatin, apelin, vaspin, macrophage chemotactic protein 1, TNF, etc. Dashed lines indicate the most speculative interactions. Malnutrition (in the original sense of undernutrition) dysregulates inflammation and suppresses immunity. It is now emerging that overnutrition does the same. The adverse impact of obesity on immunity is particularly striking in tuberculosis, a disease that may have shaped recent human evolution. In the pre-antibiotic era, it was observed that type 1 diabetes predisposes to tuberculosis. It is now becoming clear that obesity-associated prediabetes and type 2 diabetes increase the contagiousness of tuberculosis and prolong post-treatment infectiousness (59, 60, 61). Suppressed ability to generate interferon (IFN)-γ may contribute to the increased susceptibility (62), as IFN-γ enhances the antimicrobial capacity of macrophages (63) and deficiency in its production or signaling underlies most syndromes of Mendelian susceptibility to mycobacterial infection (64). In India, the case burden of tuberculosis attributable to obesity and/ or diabetes has been estimated to markedly exceed that attributable to infection by HIV (59,60). Thus, until recently, tuberculosis may have culled the obese and their closest contacts (their offspring), restricting the prevalence and heritability of obesity. In the pre-antibiotic era, tuberculosis was called “consumption.” Today’s obesity epidemic may reflect the intersection of reduced “consumption” with excess consumption. With an increased incidence of diabetes, hypertension, atherosclerosis, asthma, cancer, and tuberculosis, we do not want for reasons to halt and reverse the obesity epidemic. Without question, prevention is the best strategy, and this will presumably require increased education and increased opportunity for altered diet and exercise. Nonetheless, with over half the population in some countries already overweight or obese, therapeutic intervention is indispensable. What will work besides surgery? Of course, the primary therapy should be directed to restoring energy balance. The present analysis leads to two predictions. Insofar as people strive to reduce pre-existing obesity by eating less, we should anticipate that behavior-based therapies are unlikely to be widely effective until adipositis is controlled. Second, medical control of adipositis will probably require combination therapy. Many pharmaceutical firms are trying to correct dysregulation of hormones that control appetite and to block inflammatory mediators. Two innovative but potentially risky experimental approaches aim to reduce ROI generation by the ER (38) or by mitochondria (39). Such interventions raise concerns about how the host would handle stress. Moreover, there are three major sources of the excess ROI in obesity—mitochondria, ER, and NOXs. Suppressing ROI generation by either mitochondria or ER leaves the other two sources of excess ROI unopposed, and their output might even undergo a compensatory increase. It might be safer and more efficient if one arm of combination therapy instead aims to enhance cellular antioxidant capacity in adipocytes, endothelium, vascular smooth muscle cells, and pancreatic islets. For example, Nrf is a master transcriptional regulator of diverse antioxidant pathways, including heme oxygenase 1, thioredoxin, thioredoxin reductase, some peroxire-doxins, γ-glutamylcysteine synthetase, glutathione-S-transferases, glutathione peroxidase, glutathione reductase, superoxide dismutase, and NAD(P)H quinone oxidoreductase (65). Nrf activators have been used successfully in experimental animals to reduce the incidence of cancer (66). Obesity is the newest epidemic inflammatory disease and the only one that feeds the growth of most of the others. Several experimental questions and hypotheses about obesity arise from thinking about the disease in terms of inflammation’s evolved role in host defense (see Sidebar). At the population level, epidemic obesity may be rising because markedly increased consumption and markedly decreased exercise have coincided with a decreased incidence of tuberculosis, and perhaps of other potentially fatal infectious diseases to which obesity may predispose. However, as A. Casadeval has pointed out (personal communication), the abrupt upswing in the incidence of obesity after 1980 suggests the influence of additional contributory factors. Further research should explore a possible relation to the growing use of antibiotics (67), growth-promoting hormones (68), and other pharmaceuticals in the human food chain and water supply (69) over the same period. At the tissue level, inflammatory obesity may originate in adipose tissue because that tissue has both a unique propensity for and vulnerability to oxidant injury. Both of these traits become more extreme as adipocytes enlarge. Adipositis becomes problematic because biochemical and hormonal feed-forward mechanisms perpetuate and exacerbate it, until inflammation becomes systemic. At the molecular level, obesity may arise because repetitive overproduction of NADPH and NADH in hypoxic cytoplasm adjacent to an O2-rich lipid vacuole leads to excessive, sustained production of ROI and RNI. Their increased production mimics, to a degree, an evolved system of host defense designed to disrupt signaling in pathogens. At lower fluxes, ROI and RNI serve to integrate signaling in the host because their levels are controlled by metabolism, they are diffusible in water and lipid, their specificity is atomic, and their range of molecular targets is wide. It is for these same reasons that higher levels of ROI and RNI poison microbes. Although the same properties account for the ability of high-level ROI and RNI production to damage host cells, this is normally a brief and tolerable side effect of defense in a multicellular host that is prepared to sacrifice some of its own cells and tissues to protect the organism. Despite the risks and costs, the host’s ability to produce ROI and RNI at high levels for antimicrobial defense offers a net evolutionary advantage, because it is impossible for a pathogen to evolve resistance to these compounds by loss of atomic targets. At the philosophical level, our inflammatory and immune systems face challenges that change faster than we evolve. Inflammation in obesity is but one of many examples of the imperfection of inflammation as a tool of host defense. We can attribute this particular shortcoming to an environment recently created by human behavior that is radically different from that in which inflammatory responses evolved. When we eat so much and work so little that we repeatedly generate reactive compounds at levels normally reserved for emergencies, we treat our own cells like invading microbes. An infectious cause of epidemic obesity may exist, but it need not be postulated, because we have found a way to mimic one. 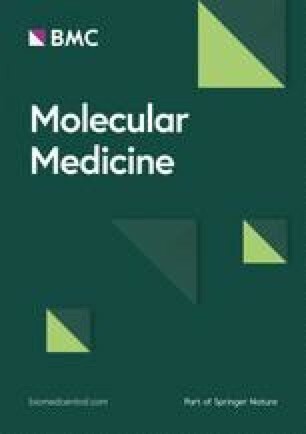 Comments by Kyu Rhee (Weill Cornell Medical College) and Arturo Casadeval (Albert Einstein College of Medicine) and editorial suggestions by Heather van Epps (Journal of Experimental Medicine) are greatly appreciated. The Department of Microbiology & Immunology is supported by the William Randolph Hearst Foundation. House of Lords, Select Committee on Science and Technology. c1998. Science and Technology-Seventh Report [Internet]. House of Lords; [cited 2008 Feb 23]. Available from: https://doi.org/www.parliament.the-stationery-office.co.uk/pa/ld199798/ldselect/ldsctech/081vii/st0701.htm. Consumer concerns about hormones in food: fact sheet #37 [Internet]. c2008. Ithaca, NY: Program on Breast Cancer and Environmental Risk Factors, Cornell University, College of Veterinary; [updated 2003 May 2; cited 2008 Feb 23]. Available from: https://doi.org/envirocancer.cornell.edu/Factsheet/Diet/fs37.hormones.cfm. Donn J, Mendoza M, Pritchard J. March 9, 2008. AP: drugs show up in Americans’ water. USA Today [Internet]. [updated 2008 Mar 11; cited 2008 Feb 23]. Available from: https://doi.org/www.usatoday.com/news/health/2008-03-09-water_N.htm.